Here is a painting of the Transfiguration. It is a 16th-century Russian icon from the Spaso-Preobrazhensky Monastery in Yaroslavl, which is to the northeast of Moscow. Readers will be familiar with the scene. Christ is on the mountain flanked by the two prophets, and the three disciples are stunned by the sight of the transfigured Christ. This is a glimpse of his heavenly glory, hitherto unseen by the disciples. The nimbus that surrounds Christ in this picture is called a “mandorla”, the Italian word for “almond”, from its elliptical shape. The season of the Epiphany (also known as Theophany) is the time in which the first manifestations of God’s glory are commemorated, and especially the Baptism in the Jordan; in the East, the feast is wholly focused on the latter, and the Adoration of the Magi is commemorated at Christmas. As such, they all point to this moment as the fulfillment of all epiphanies. The mandorla surrounding Christ usually shows concentric bands of shading which get darker toward the center, rather than lighter. It is painted in this way so as to communicate to us, pictorially, the fact that we must pass through stages of increasing mystery in order to encounter the person of Jesus Christ. This encounter, which takes place in the Mass with the Eucharist at its heart, is one that transforms me supernaturally, so that I can begin to grasp the glory of Christ more directly. This encounter is made possible by my baptism, confirmation, and communion so that I have ‘put on Christ’ as St Paul says in Galatians. God’s actions are not in any way restricted by the Sacraments, of course, but as a general rule, until I become Catholic I am going to be dazzled into blindness by the transfigured Christ, and the mandorla will look like a jet-black envelope with a heart of darkness. Nevertheless, prior to being fully part of the body of Christ, I was able to perceive, those outer rings of the mandorla. In this context they represent the Light of Christ reflected in the cosmos, and Christian culture and art. This tells me there is more to know and love and I yearn for it. This is the power of beauty, and of art in particular, and is why the rejuvenation of Catholic culture and Catholic art, in particular, are so necessary. We need them to speak powerfully to people today of Christ and draw people into the Church. Beauty is a perceptible sign of something which we cannot see, Almighty God. It calls us to itself, and then beyond to Him who inspired it, and who is Beauty itself. Creation is beautiful because it bears the mark of the Creator; and the culture or any aspect of it, whether mundane, sacred or high art can speak of it too. Even everyday Christian activity is beautiful - graceful - if it is inspired by God and will draw people to God. The Christian life well lived is one in which every discernible aspect our lives contributes to the brightness of the outer rings of the mandorla through inspired contributions to the culture. This is because we are part of the mystical body of Christ, the Church, which is the transfigured Christ of the painting above. Each of us is a pixel of supernatural light in the heart of darkness! The artist is called to contribute to the culture by his painting, but each of us contributes in our own way. The most powerful formation that will enable us to be contributors to a beautiful Catholic culture that bears this cosmic beauty is the central activity of the Church, the worship of God. Christian culture permeates the life of the Church and of the world - the sacred and the profane - and so is an important part of the sign of Christ and of the world to come. It is a principle that potentially permeates all human activity. 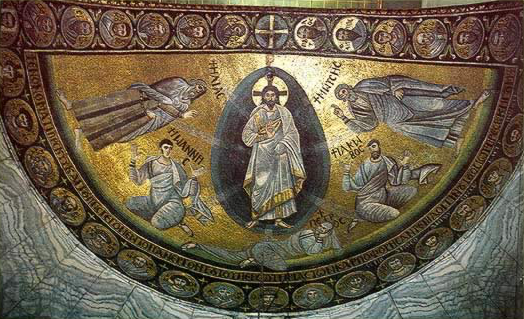 Below is the Transfiguration mosaic from St Catherine’s Monastery, Mt Sinai.